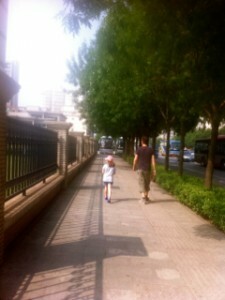 My daughter and husband on a humid, hot day in Tianjin. I had been musing with my husband and daughter (currently aged 6) in the UK about venturing overseas to live and have some great adventures! I had taught as a volunteer teacher for a year when I was 19 in Swaziland in a primary school in Mbabane and this experience of teaching overseas changed me forever. I totally blame it for giving me itchy feet ever since! We considered Japan a few years ago after experiencing a longing to live where Studio Ghibli films are created (think Spirited Away, My Neighbour Totoro…) and after a very successful three-week trip to Australia with our then 2 year old daughter, who proved to be quite the little traveler, found that we couldn’t stop thinking about ‘moving away’. I had taught in schools since I graduated in 1998 in the UK, English, music and then body percussion, singing and song-writing and virtues through dance until we had our baby girl in 2007. I stayed at home to raise her full-time. Teaching lots of children transformed to focusing on bringing new life to the world, I loved it! In the next years I did a mixture of teaching part time then ended up starting my own company, raw cake-making, but whilst I enjoyed whipping up exquisite new creations in my kitchen I always felt something was missing. And it took me quite a while to realise that that ‘something’ was working with children again. Forward wind to April, 2013. I had literally just been speaking to mothers at my daughter’s school, saying how much I’d love to teach at an international school and how we’d love to travel. One of my friends had just secured a post at a school in Brunei and I went home and spoke to my husband yet again about our wistful daydreams – it just seemed that no opportunities would ever present themselves. One week later, on the first day of a new job in a school which I had for one term, I received an email, out of the blue. It simply said, ‘Are you interested in this post?’ It was for a teaching job in an international school in Tianjin, China. I found myself emailing back, saying that yes, I was interested and could I have more information? My hands were literally shaking with excitement! Was this really going to present itself as a real opportunity to move to a different land and have new adventures with my family? It seemed I had to say ‘yes’ to teaching before the Universe decided to give me the thumbs up! And two days later, I was being interviewed via Skype for the position of Pre-K 3 teacher in an international school! I had sent in my resume and they were keen for me to work there. I then got cold feet – how could we go overseas? Would the pollution in this city affect my asthma and my daughter’s health? All the doubts and worries of my friends clouded my judgement and I found myself reconsidering the offer. Two days later, I sat in a house that we were about to move into, and nothing felt right! We were supposed to go to China – I could feel it in my bones. I wrote to my contact and accepted my first international teaching position! After I announced to the head teacher of the Primary school I was in that I was moving to China at the end of the school year, things just started falling into place. At the end of term, I received the most fabulous farewell and goodbye booklet from my team and the children (my 6 and 7 year olds thought I was going to China for the day!) and my husband’s boss even said there was a chance for him to work remotely overseas. The house we were supposed to move into got new tenants easily… every single door opened for us to leave our town – with a few hurdles on the way – but all pushing us to get on a plane! It wasn’t until we boarded that plane that it really sank in – we were moving to Tianjin. I was going to be working full-time in an international school. My daughter would attend the school including four lessons of Chinese a week! Life would be different forever and we would always have stories to talk about from this great experience. How could we say no to this? So that is how only a few short weeks ago we got to move from the UK to China and I will be sharing my new life in Tianjin as it unfolds. This entry was posted in Victoria Leith and tagged first time overseas, international teacher, teaching in china. Bookmark the permalink.